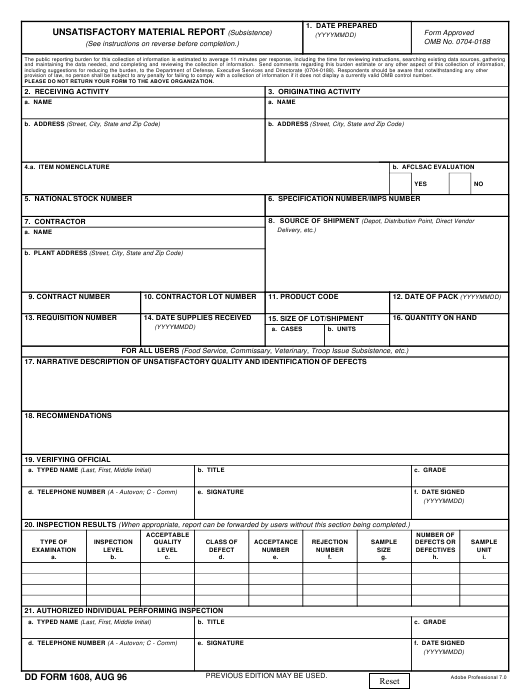 DD Form 1608 - also known as the "Unsatisfactory Materiel Report (subsistence)" - is a United States Military form issued by the Department of Defense. The form - often incorrectly referred to as the DA form 1608 - was last revised on August 1, 1996. Download an up-to-date fillable PDF version of the DD 1608 below or request a copy through the chain of command. considered satisfactory as a process average (MIL-STD-109). requirements, special attention should be given to Item 17. ITEM 3. State complete name and address in the clear. ITEM 7. To be obtained from shipping container. ITEMS 9 and 10. To be obtained from shipping container. ITEM 12. To be obtained from shipping container. activity records. Enter complete requisition number. of product, i.e., on hold, normal issue, or expedited issue.